Georgina Roberts from Trye Farm, near Penzance, is the 2016 winner of the Dairy Crest & NFU Scholarship Awards. 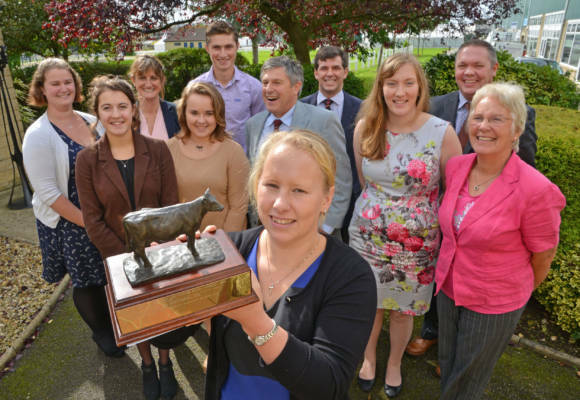 The Awards are made to dairy industry related students from the south-western counties of Cornwall, Devon, Somerset and Dorset. Georgina was one of five finalists and impressed a panel of judges from the Award plus industry sponsors, with her rounded appreciation of the overlapping and interaction between consumer expectation, environmental awareness and economic pressures of production. “Georgina inspired us as she recounted how she has been encouraged to dream big by a number of forward thinking, proactive and inspiring individuals within the dairy industry,” said Richard Kallaway, chairman of the Awards. Georgina will use her Award to fund her final year Agriculture Business Management course at Duchy College. Alongside her studies she works on the 180ha family farm which is all grass and devoted to dairy and beef. The other finalists were: Charlotte Bolton, Emma Gillbard and Joshua Misselbrook from Devon, and Jessica Nurse from Somerset.